Today’s question comes to us from Anne via email. This is such a great question. 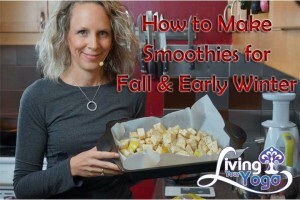 You are quite right as the season turns to fall and the weather gets cooler we move into vata season. In the fall the wind begins to blow, the air becomes cold and dry and the vata dosha can easily become imbalanced. You can tell your vata dosha is imbalanced if you are bothered by the cold and wind, you are anxious, you have trouble sleeping, dry skin, hair and nails, you are bothered by excess stimulus, and you feel overwhelmed and disorganized. Anne is right that overdoing raw fruits and vegetables at this time of year creates too much dampness in your body and is like pouring water on an already weak digestive fire. Cold drinks like smoothies are to be avoided. 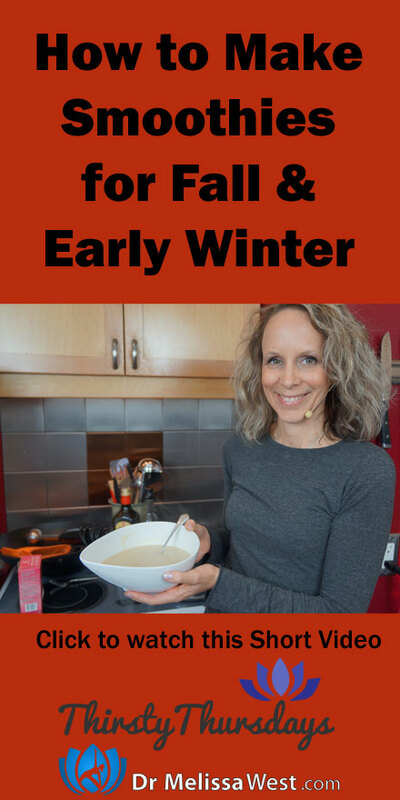 Now is the time to eat warm, cooked, seasonal foods. Root vegetables are nice and grounding for your vata constitution at this time of year. Instead of your cold smoothie, try herbal teas, warm spiced milks and warm lemon water with honey. I will probably to another video incorporating these ideas as well. Chop all your ingredients evenly and place in a large bowl. Cover with olive oil, salt and poultry season. Place in an 8×14 baking pan and put in the oven at 425 degrees for about an hour until the root vegetables are a lovely roasted brown colour. Remove the vegetables from the oven and boil your kettle. Place the root vegetables in a soup pot. Cover the vegetables with boiling water. Blend the soup with an immersion blender or blend it in your blender in batches. That’s it! You have your delicious blended soup.